Just say no – to winter hibernation! The winter blues … the winter doldrums … we’re right at that time of year when many people feel challenged to remain committed to their exercise program. This could be due to the weather, or it could be a product of settling back into routine after the excitement of the holidays. But whatever the reason, try to keep your focus on the benefits of exercise in order to sail through the winter season. PWC trainers Kimberley Siock-Cubbage, Sharon Steele and Amy Wagner chime in on how continuing to exercise can make winter a positive experience. Exercise can save your electric bill in addition to your waistline. How so? Winter exercise increases the body temperature, keeping us warmer – without the layers of fat. Regular exercise also helps strengthen the immune system, thus helping reduce or prevent colds and flu. How about trying a new group exercise class this winter to experience these mood boosting, warmth producing and immune strengthening benefits? Amy adds, “It’s imperative in these cold months that we continue to exercise rather than allow our bodies to go into hibernation. If you struggle to exercise in the winter, you are not alone, but be aware inactivity leads to weight gain as a result of burning less calories.” On average, that weight gain can add up to 6-8 pounds. If you walk through the pool doors and can’t quite hang on to Amy’s tropical vacation meditation vibe, she suggests talking to an aquatic instructor who can help match you with the right class for you. This proactive approach is positive in itself. “Doing that is definitely a choice for the New Year that you won’t regret,” Amy says, adding one more thought that might push you to take the plunge: “A person can burn 400-500 calories in an hour depending on the activity, their weight, water temperature, volume and buoyancy.” In other words, winter weight gain won’t be anything YOU have to worry about! If winter leaves you feeling a bit unsettled and anxious with a case of the “Post Holiday Dulldrums” (thank you Sharon! ), try to start a new exercise routine or stick with your established program. Get into the gym, jump into the pool, make a workout date with a friend. Take advantage of resources: you might hire a personal trainer or talk to group fitness instructors and fitness instructors on the fitness floor. 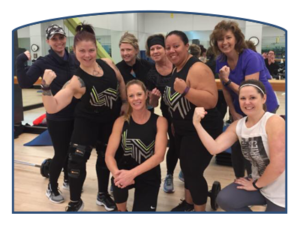 They are all happy to share information on how you can get started or keep going with your exercise program this winter!